The OE Buoy is a floating, oscillating water column device. The water columns are held in rectangular tubes facing away from the incident waves. This device uses wave energy to compress air in a plenum chamber and pump it through an air turbine system. The mouth of the OWC is facing away from the wave direction; this results in high-energy efficiencies at the operating point because of the motions of the float system relative to the waves. However in extreme waves, the efficiencies reduce. Through the FP7 funded CORES project (http://www.fp7-cores.eu/), new components and concepts were tested on the OE Buoy at sea and these real, validated and verified results were integrated into a holistic system model. This model provides a Toolbox for wave to wire simulations of complete WEC systems. The Marine Institute/SEAI Galway Bay Test site was the location for the field test of the project. The project ended in 2011. The device was located at the Galway Bay Test Site, near Galway, Ireland at about 21-24 m water depth. The OE Buoy device was subject to eight months of sea trials between 2007 and 2008 at the Marine Institute/SEAI Wave Energy Test Site in Galway Bay. During the trial period, the device was subjected to a wide range of wave conditions including a severe storm with wave heights of 8.2 metres. It was found that the mooring system had no difficulty coping with these conditions and the device as a whole did not suffer any defects from the extreme waves. The project ended in 2011. The device was tested at the Galway Bay Test Site operated by the national Marine Institute and the Sustainable Energy Authority of Ireland. As a national test site, the area is pre-consented. Given that the device deployment was a demonstration and for a time limited period, a full scale Environmental Impact Assessment was not carried out. An environmental characterisation and appraisal was, however, carried out immediately after device removal from the site and again one year later to establish seafloor conditions 24 months after the removal of all equipment from the site. The initial environmental appraisal carried out involved grab sampling five sites within the test site and one control site, approximately 650m south of the test site. Two replicate faunal grab samples were taken at each site in addition to a sediment sample. SCUBA diving was also used to collect sediment profile images and still photography of the sea bed. The report also included a desk survey of marine reptiles, mammals and birds that occur in the area and any possible impacts that might arise given the presence of the buoy. The only noticeable difference between the test site samples and the control was the occasional occurrence of mussel (Mytilus edulis) shells within the test area. These shells were probably sloughed off the ocean energy device while in situ or when it was being moved into the docks at Galway. Observations of the device show that gulls use it as a roosting and feeding site. Gulls were seen to alight on the structure and stay there for periods of time and were also seen to collect epifaunal species such as mussels and feed on them on the device. Results from the second dive survey, 24 months after device removal, indicated that the seafloor that had been in the footprint of the Ocean Energy Buoy, showed no indication of impact from the previous operations and moorings at the site. The seafloor consisted of fine muddy sand with observed faunal species and numbers typical of this environment. Environmental Website: No official environmental webpage. Related reports are available from the HMRC, University College Cork on request. Marine Environmental Appraisal of an Ocean Energy Test Site in Inner Galway Bay. Produced by AQUAFACT International Services Ltd., Galway. On behalf of the Hydraulics & Maritime Research Centre, University College Cork. April 2010. Marine Environmental Appraisal of an Ocean Energy Test Site in Inner Galway Bay Part 2- Dive Survey. Produced by AQUAFACT International Services Ltd., Galway. On behalf of Hydraulics & Maritime Research Centre, University College Cork. December 2011. 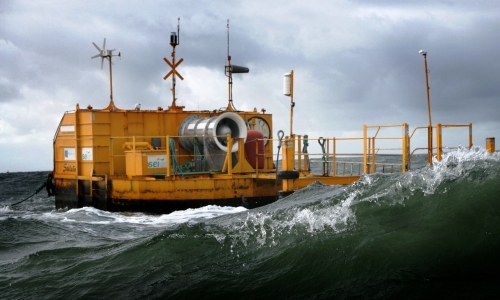 Testing of Ocean Energy Buoy at Galway Bay, Ireland is located in Ireland. Collected samples of sediment from 6 stations. The sediment type within the test site varied between muddy sand, sand and slightly gravelly muddy sand. The control site, station S6, was classified as slightly gravelly sand. Sediment samples taken at each 6 stations. The faunal returns were sieved on a 1mm mesh sieve. Samples were then sorted under a microscope (x 10 magnification), into four main groups: Polychaeta, Mollusca, Crustacea and others. Samples yielded 117 species accounting for 1,746 individuals, ascribed to 7 phyla. Of the 117 species; 56 were polychaetes (segmented worms), 31 were crustaceans (crabs, shrimps, prawns), 18 were molluscs (mussels, cockles, snails etc. ), 6 species were echinoderms (brittlestars, sea cucumbers), 2 species were cnidarians (sea anemones, corals), 2 species were sipunculids (peanut worms) and 1 species was a phoronid (horseshoe worm). The results indicate a high level of similarity between the sampled locations and suggest that there has been no noticeable change in benthic fauna within the site. The SPI images indicate a healthy Stage community present at the site. The only noticeable difference between the test site samples and the control was the occasional occurrence of mussel shells within the test area. These shells were probably sloughed off the ocean energy device while in situ or when it was being moved into the docks at Galway. Desk based study of Leatherback Turtles . Use of existing data (CITES and EU Habitats Directive). The turtles are considered unlikely to be affected by the working of the device. Field based study (IWDG Sightings). Cetaceans were recorded between 2008-2010 around the Galway Bay area. All marine mammals are considered to be able to swim at fast enough velocities so as to be able to avoid the physical actions of the device. Inner Galway Bay Survey of birds. Monthly observations of species and recording numbers of birds between 1994-2001. The site of the device provides both feeding and roost sites for most of the species observed. The site has important populations of breeding birds; Sandwich Tern and Common Tern. The device only affects diving birds such as; sooty shearwater, Great Northern, Black throated and Red Throated Diver, cormorant, shag, red breasted merganser, tern and auk species. Any bird that may be drawn into the device will be flushed out with water. Gulls were observed feeding on mussels on the device.